I love that we were able to shoot Christy and Tyler’s engagement session at Branch Museum of Architecture and Design and along Monument Avenue’s street of beautiful historic homes! I love architecture, and these two are both architects themselves so the location was very appropriate for them! Christy was studying landscape architecture and Tyler was studying to be an architect when the two met while joining the same professional fraternity at Virginia Tech. Tyler worked up the nerve to ask Christy out and the two talked for more than four hours on their first date! Now they’re living in Atlanta, Georgia, but they wanted to return to the mountains of Virginia where they met and fell in love for their wedding. So they’re planning a destination wedding to Early Mountain Vineyards. I loved how happy these two were, laughing together throughout while they braved a cold January day for their engagement portraits. Christy’s mom, Dianne, joined them and gamely carried their jackets and whipped out Christy’s hairbrush speedily in between shots. It was great fun to meet the couple and an added bonus to get to know the mom-of-the-bride a little before the wedding, too! 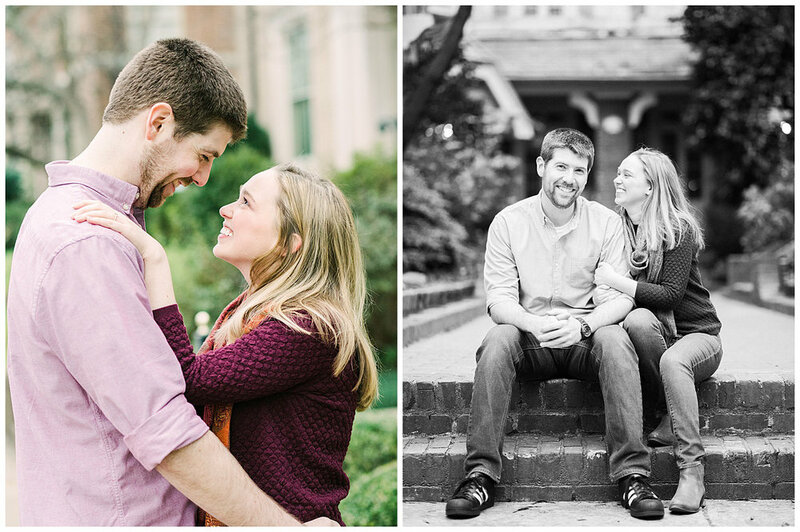 Here are a few of my favorite photos from Christy + Tyler’s engagement session on Monument Avenue and at the Branch Museum. Check out Christy + Tyler’s Early Mountain Vineyards wedding here!